There has a been a changing of the guard in the most prominent auction boxes around the world. Tobias Meyer (the wunderkind), Simon de Pury (the salesman) and Christopher Burge (the avuncular master) have all stepped down in recent years. And though there are a few old hands still ably spotting bids and figures like Jussi Pylkkanen emerging as global stars, the auction trade needs an exciting new face … and voice. Of the men and women auctioning off vehicles on the Monterey Peninsula, none is more colorful or effective than Girardo. By turns worldly, winsome, cheeky and coy, he ismultilingual with a dry wit and a clipped British syntax, moving cars more entertaininglythan his competitors. 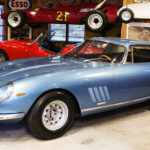 The RM auction in Monterey was listed as the most popular event of the entire car week in a2014 poll by the Monterey County Convention and Visitors Bureau — even more popularwith more people than the famed Concours. “He’s a very unique auctioneer, and he has a huge impact on the bottom line,” said Hagerty’sJonathan Klinger.